Built prior to 1871 for Edmund Green/Greene. Maybe. The origins of this house are murky. Ida Greene conveyed it to Wyer Greene in a deed dated 1884 but there is an 1871 deed from Edmund Green to William Green for what seems to describe the same property. Ida’s deed, and all subsequent deeds based on it, speaks of a lot numbered 104 on a plan but the volume information given does not bring up any data. Somehow, in the period between 1871 and 1884 the property was transferred from William to Ida but I have not found the link. It’s a common urban form with a full bay element on the right with a shallow stacked bay window on its facade. On the left is an entry and stair hall. The details of the house are what set it apart. And those details are many. First of note is the house sets on a particularly high base. As the neighboring houses are not this way, it’s not likely there was an underground situation requiring the extra height. I think it’s there to increase the verticality of the facade. 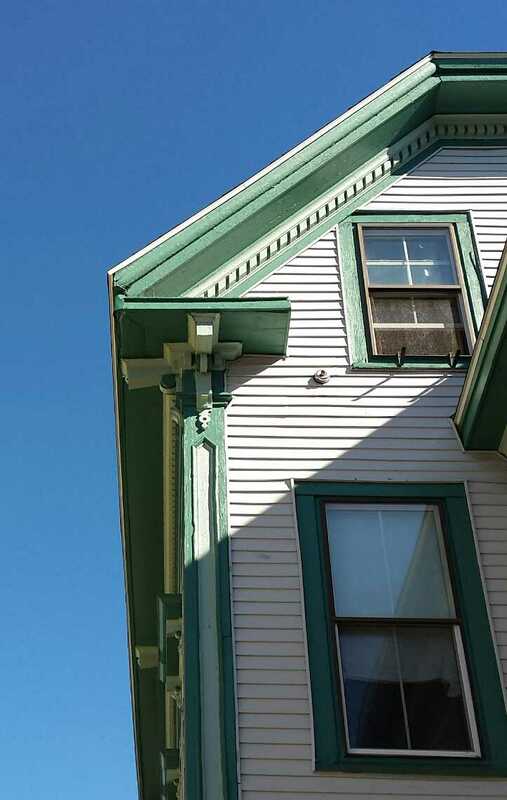 The bays are a delight of brackets, dentils, diamonds and more. Topped with a heavily projecting, and surprisingly conservatively molded, cornice and roof. The bay and entry are exuberant examples of the potential creative power in the post civil war architectural detail catalog. The entry has been redone since the 1924 tax photo was taken. More info in the text. As the early history is difficult to work out, I have chosen to start with the Wyer Greene era. The ‘e’ at the end of his name seems to have been added after 1873 as Wyer is listed in the 1870 census without it and it’s not on the marriage license for he and Clara Farrar of 1873. All records I have seen dated after 1873 show the ‘e’. He was born in Portland in 1835. The first official record for him is the 1870 census where he was listed as a merchant boarding with Mrs Henrietta Colburn on Congress Street. This is collaborated by both Wyer’s and Henrietta’s listing in Beckett’s City Directory of 1870. As a side note, the census record shows 21 boarders living with Henrietta & Sarah Colburn. 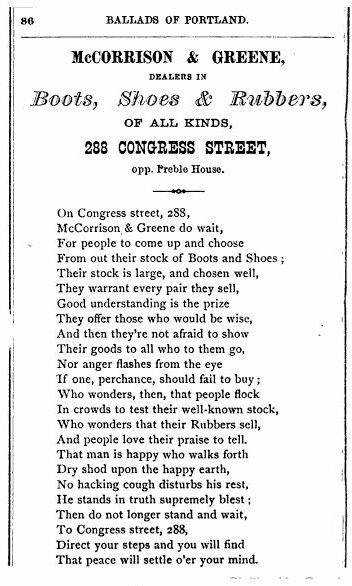 Beckett shows Wyer was partnered with Charles McCorrison in an eponymous firm of McCorrison and Greene selling boots and shoes on Congress across from the Preble House. 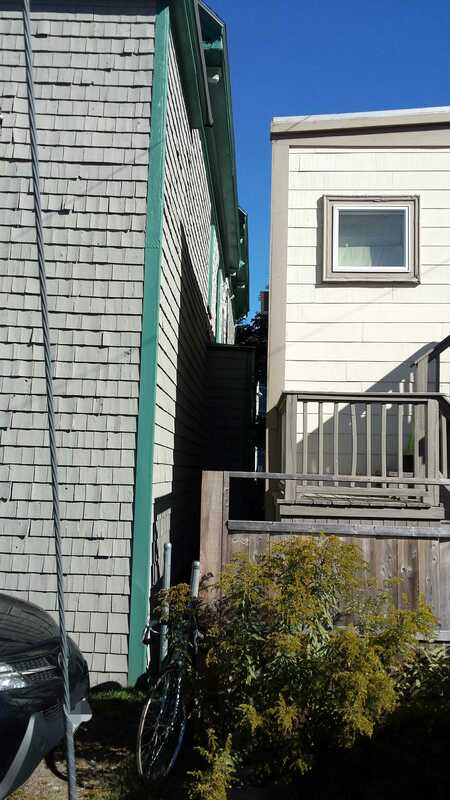 I’ll give the vinyl siding guys some credit for trying to match the profile of the hood over the window, but why did they do all that then cut the extensions off the sill? The windows are for the most part plain. The sills, side casings and architrave are unadorned. The whole is topped with a very intricate hood on brackets. The hood is molded and has scroll work in the tympanum. There is an oversized key stone topped with a trefoil form. 288 Brackett Street in 1924. Image property of the Maine Historical Society. Wyer and Clara lived in our subject until 1901 when they sold it to Ami Whitney. Whitney was a very successful businessman and real estate developer/investor in Portland in the late 19th and early 20th centuries. He is worthy of an article of his own and, as such, we will not spend allot of time on him now. As he had built an impressive mansion on Spring Street in 1878, we can be sure this purchase was solely an investment. Whitney sold the property to Samuel Elowitch in June of 1920. The rear ell is a bit shorter than the main block and is offset to one side. Most of the detail of the main block is carried over in a reduced form. The windows do not have the hoods. 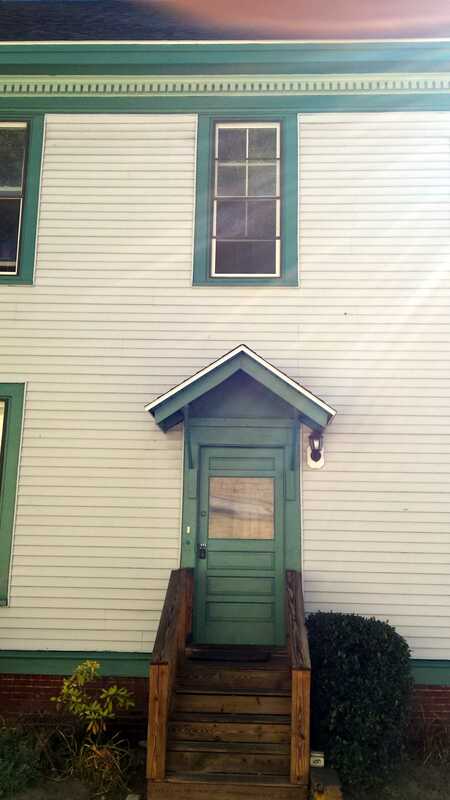 I believe the ell was extended at some point as the tax photo seems to show it ending at the second window/door. Sam and Ida Elowitch were Russian imigres who had come to the US in 1906 & 05 respectively. They married in Portland in 1910. They had 7 children two of which started a well known local chain of tire stores. They later developed a process for constructing industrial tires and formed a corporation which is still operating today. Their grandson Robert and his wife own and operate a well know international fine art auction company based in Portland. Sam and Ida sold 288 Brackett to Minnie Clement a mere 4 months after purchasing it. The deed carried a provision allowing them to ‘remain in the second floor ‘until a suitable rental can be found’. They payed $40/month rental. There is no record of how long they stayed but, in 1924, they were shown as owning a home on nearby Cushman Street. 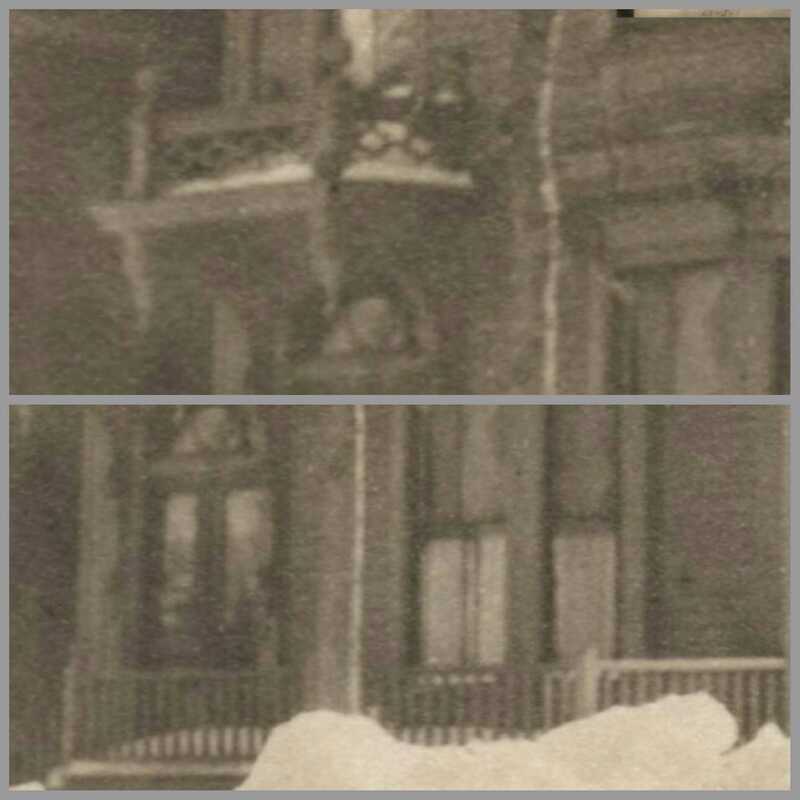 A detailed view of the entry and front porch from the 1924 tax photo. The tax photo of 1924 highlights a few more changes to the exterior in the interim. The first was the existence of a front porch since removed. It must have been fairly shallow as there is less than 4 feet from the building to the sidewalk. One would assume access, if there was any, was gained via the entry porch. The entry itself shows changes. 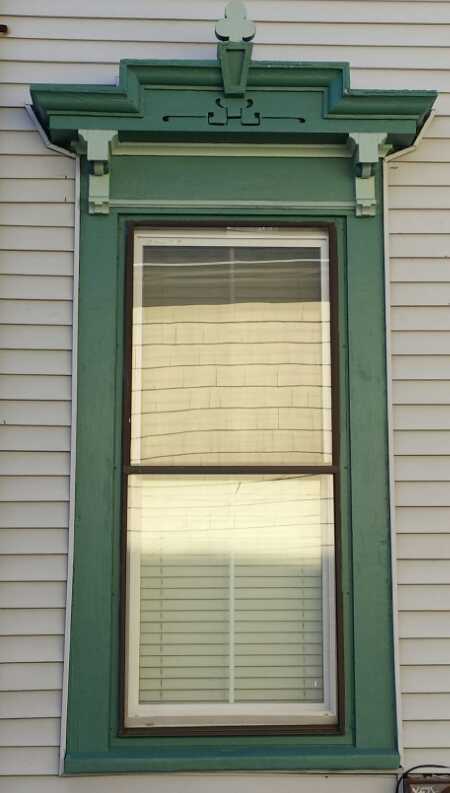 There was a more ornate and semi-circular transom window compared to the current arrangement. Perhaps most striking is the very ornate balustrade on the roof over the entry. It looks like it was very expressive and would have given the facade even more intensity. Your’e not gonna fit a ladder in there. 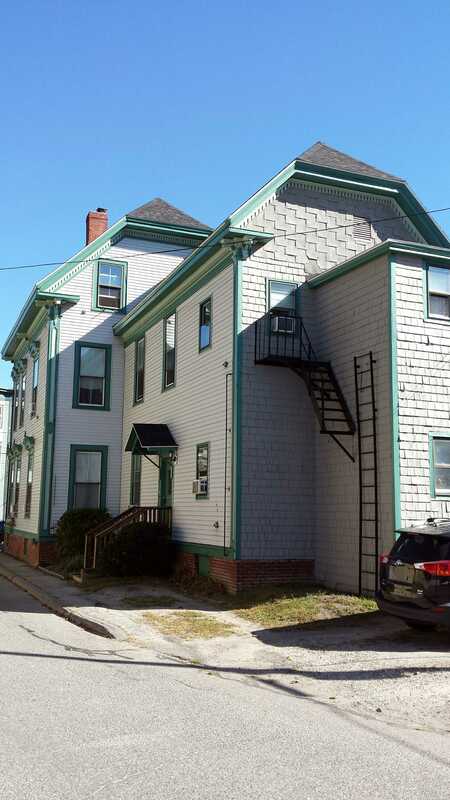 When she purchased the house at 288 Brackett, Minnie Clement was already an experienced boardinghouse operator having operated one on Hill Street for a couple of years prior. It wouldn’t be an easy ride for Minnie and Harry. A series of mortgages would result in foreclosure in early 1926. Harry died at some point in the 20’s as the 1930 census has Minnie listed as a widow living with her two sons in Gardiner. The next owner, Julius Rosenberg, would see the same thing happen when the Portland Savings Bank foreclosed in 1937. Interestingly, the bank would retain ownership for 18 years before selling it in 1955. When Sarah Gould bought 288 Brackett in 1955, she was 60 years old and had become a widow 3 months earlier. She remained in the house until 1959 when she sold it to Belle McCormick. Sarah died in 1974 and was buried with her husband, Clarence, in Gorham. Belle McCormick was a Canadian national who had come to the US prior to 1920 when she and her husband Joseph were in Chester Maine and both working as logging camp cooks. By 1940, she is divorced and running a rooming house, I’m starting to see a pattern here, on Cumberland Avenue behind city hall. Belle sold 288 Brackett in 1968. She died in 1982. 262 Cumberland Ave. Belle McCormick’s former rooming house. Image property of the Maine Historical Society. The next owners, Carroll and Lorraine Nevers, owned the house until 1981. There is not much information on them. They were married in 1964 & Carroll died in 1988. That’s about all I have found to date. After the Nevers, the ownership would change 4 times with most of the period seeing corporate entities being the predominant type. The house is currently 5 apartments. 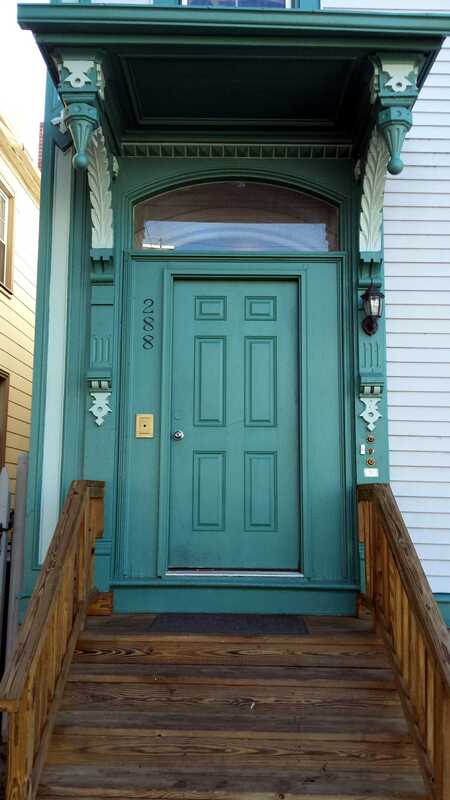 This entry was posted in Architecture, Brackett Street, History, Images, Italianate, Marshall Street, Then & Now, West End Walks and tagged 19th Century, Architecture, History, images, Italianate, Maine, Portland, West End on October 18, 2017 by alewifecove.